Herod the Great, the king of Judea who ruled not long before the time of Jesus, seems to have eluded historians once again. 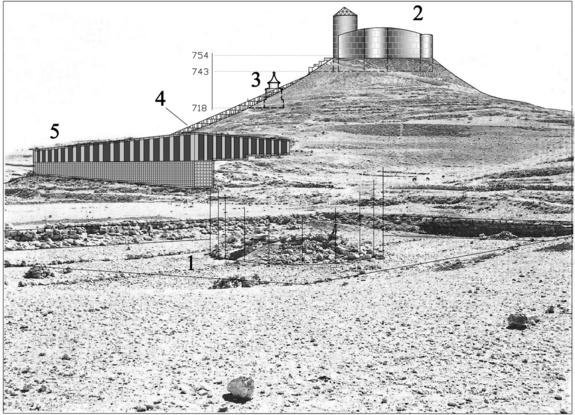 In 2007 archaeologists announced they had found the great king's tomb, a surprisingly modest mausoleum that was part of the Herodium, a massive complex built by Herod on a cone-shaped hill in the desert outside Jerusalem. A pool and garden (1) beautified the lower portion of the complex, while a fortified stronghold (2) was built at the top of the mound. The tomb (3) was in the middle of the two. A monumental staircase (4) led up to the palace and a lower palace (5) was located below. But what everyone thought was his final resting place may not be. The modest structure is too small and modest for the ostentatious king; its mediocre construction and design are at odds with Herod's reputation as a master planner and builder, archaeologists now say. King Herod, who lived from 74 B.C. to 4 B.C., was a vassal king for the Romans. Known as both a genius and a madman, he executed many of his family members but doted on his mother and father. He built lavish building complexes, including the famous fortress of Masada, though he funded such huge projects by burdening the people with backbreaking taxes. In the New Testament, Herod is said to have ordered the slaughter of thousands of innocent babies after prophets predicted one would grow to be a rival. Documents from the Jewish historian Flavius Josephus suggest Herod was buried at the Herodium, laid out on a gold bed draped with opulent fabrics, and thronged by the entire army and a massive funerary procession, said Joseph Patrich, an archaeologist at the Hebrew University of Jerusalem. But Herod's exact burial place remained a mystery for thousands of years. Now, Patrich and his colleague Benjamin Arubas, also of the Hebrew University of Jerusalem, are claiming the tomb isn't Herod's at all. For instance, the building is small compared with other royal tombs of the day. "These are quite moderate dimensions if you are thinking about a king of the stature of Herod the Great," Patrich said. Moreover, the tomb has only one pyramid, whereas the tombs of the Hasmoneans — the royal dynasty that preceded Herod — have seven pyramids, Patrich said. In addition, the complex has no gate or courtyard for visitors to come and pay their respects to the departed. Royal tombs at that time had much more elaborate courtyards. "There is hardly place for 20 people to stand conveniently, and there is no respectable gateway to lead in," Patrich told LiveScience. Furthermore, the building has an awkward layout, with two staircases above the mausoleum barring entrance to the tomb below on one side, and two shabbily constructed walls on the other side. The complex isn't aligned symmetrically with the axis of the rest of the Herodium complex, Patrich added, a design faux-pas that would have been out of character for Herod. Finally, the coffins in the tomb were made of local limestone and red stone, not the elaborate marble, or even gold, that would have suited Herod's grand tastes. If the tomb isn't Herod's, then whose is it? 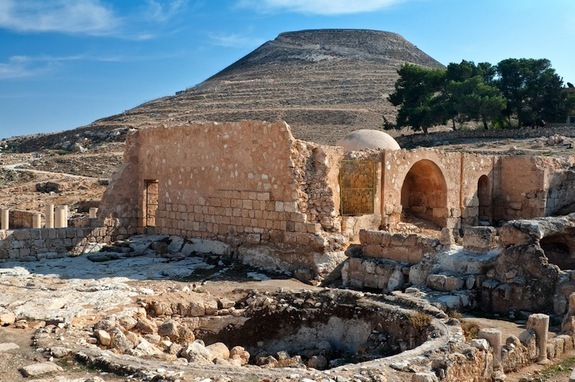 To build the Herodium, Herod covered other buildings in the area but left this one intact, suggesting that the person buried there was "very dear to Herod," Patrich said. So it's possible that Herod's close family members — such as his mother, father or brother — may occupy the building. The great king's exact whereabouts remains a mystery, but there are many parts of the complex that have yet to be excavated, Patrich said. The findings, which have not been published yet in a peer-reviewed journal, were presented Oct. 10 at the "Innovations in Archaeology in Jerusalem and the Surrounding Area" conference in Jerusalem.